Last summer we had the wood on the outside of our house painted. The trim, the windows, and the front porch were all done. Something about a full can of leftover paint sitting in my carport just didn't feel right. That's when I decided to spruce up the front porch and that leftover (already paid for) can of paint fit nicely into my plan. It's been about ten years since I painted the door black. Thanks to our cat, the weather, and just general wear and tear, the door was looking a little (a lot) worn. 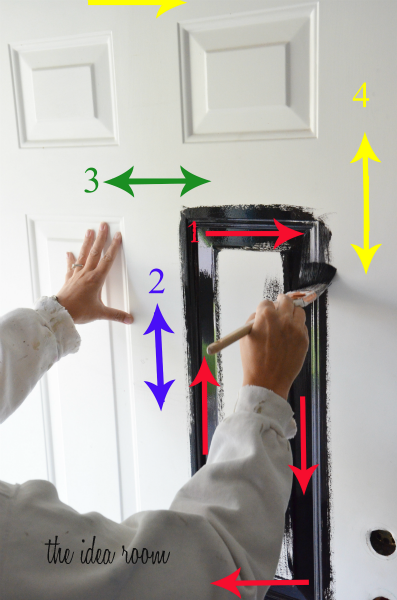 So, I headed to Pinterest to figure out the best way to paint the door. This is the tutorial I followed. End of round one...clearly there will need to be two rounds.